Ethel Smyth took on the forces of inequality, in both politics and culture, producing highly acclaimed works of music that are now all but forgotten. 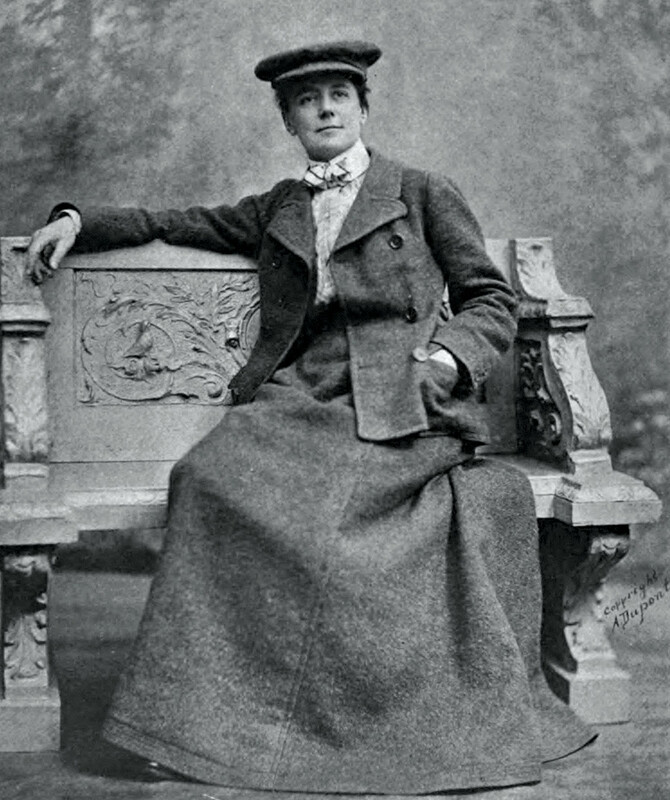 Equal temperament: Ethel Smyth, c.1915. Sir Thomas Beecham arrived at Holloway Prison in the spring of 1912 to find it in the grip of a musical frenzy. The inmates – many of them suffragettes – were marching around the courtyard, singing the anthem of the Women’s Social and Political Union (WSPU) at the top of their voices, while, from a window high above, its composer, Ethel Smyth (1858-1944), beaming with delight, ‘beat time in almost Bacchic frenzy with a toothbrush’. The prison governor was deeply embarrassed, later dismissing Smyth as ‘highly histerical [sic]’, ‘neurotic’, even ‘mentally disturbed’. But Beecham – who had come expressly to visit Smyth – knew that she was nothing of the sort. She was, to be sure, a bit outré, at least by the standards of the day. A dedicated campaigner for women’s suffrage, she made no secret of her fondness for cricket, cigar smoking and bisexual relationships. But she was also one of the most dazzling musicians of her day. There, in the prison yard, she was giving what would prove to be her most memorable concert. Smyth’s musical career had been a constant battle against male privilege. The daughter of a distinguished artillery general, she had been given a traditional Victorian education. She was a good student, with an ear for languages and a liking for sports, especially riding, tennis and golf. But she excelled at music. By the age of ten she had already mastered the piano and had composed her first hymns. Two years later, an accident with a knife forced her to give up the piano; but by then, music was in her blood. Taking private lessons with Alexander Ewing, a popular writer of hymns, she fell under the spell of Berlioz and Wagner, and realised that she, too, wanted to be a composer. Her father was opposed. Music was all very well as a pastime; indeed, it was necessary for a young lady of her class. Her future husband would no doubt take great pleasure in listening to her sing in the drawing room after dinner; and she would derive no little amusement from playing with friends in private. She could even write a few pieces now and again, if she liked. But a career in composition? Out of the question. Eventually, she wore her father down and went to study at the Leipzig Conservatory. Founded by the composer Felix Mendelssohn, it had a dazzling reputation, but it proved a disappointment. She disliked its stuffiness and deplored the low standards of teaching. After a year, she left and took up lessons with Heinrich von Herzogenberg. How much he taught her is not known. He was a skilful enough composer, but hardly of the first order. What he lacked in genius, however, he made up for in connections. Through him, Smyth met some of the leading composers of the day, including Grieg, Tchaikovsky, Dvořák, Brahms (who nicknamed her ‘the oboe’) and, most crucially, Clara Schumann. Encouraged by Schumann, Smyth threw herself into composition; and on 2 June 1880 she oversaw the first public performance of her work: a string quartet in D minor. Over the next seven years she would go on to produce a clutch of further quartets, at least one sonata for violin and piano and a sizeable number of lieder. Reactions were, admittedly, muted. With the exception of Schumann, female composers were viewed with scepticism, if not outright hostility; and on 22 March 1888, Joseph Joachim – the great Hungarian violinist, composer and conductor – told Smyth that her pieces were ‘unnatural, far-fetched, and not good as to sound’. Smyth refused to be downhearted. Returning to England in 1890, she worked harder than she had ever done before and was rewarded with her first real taste of success. On 26 April that year, her Serenade in D was performed at the Crystal Palace to rapturous reviews; six months later, this was followed by an Overture to Shakespeare’s Antony and Cleopatra; and on 18 January 1893 her Mass in D received its première at the Royal Albert Hall. Audiences were dazzled. Writing to Smyth some time later, George Bernard Shaw recalled that the Mass had cured him ‘for ever of the old delusion that women could not do man’s work in art and all other things’. Brimming with confidence, Smyth set her sights even higher. Although orchestral pieces, chamber music and lieder were all highly valued, she knew that opera was the yardstick against which truly great composers were judged. Women had, of course, written operas before. Princess Amalie of Saxony, for example, had written a number of popular comedies 50 years earlier. But none had stood the test of time and the repertoire was still dominated by men. Smyth’s first effort – a two-act comedy called Fantasio – was a disaster. Its premier, in Weimar, met with scathing reviews and, after a single performance in Karlsruhe, it was dropped, never to be played again. Her next attempt, Der Wald (The Forest) – a ‘short and tragic’ tale of a young woodcutter’s frustrated love – received a similarly harsh reception when it debuted in Berlin in April 1902. But Smyth was quick to learn from her mistakes. When a revised version of Der Wald was performed at Covent Garden later that summer, it was greeted with wild applause, including from members of the royal family. The following year it was put on at New York’s Metropolitan Opera and was a smash hit. Smyth took seven curtain calls at the première and the production took more money at the box office than any other opera that year. Smyth felt vindicated. She had shown, beyond doubt, that a female composer was more than a match for any man. But she was still pained that, in all other areas of life, women chafed under the yoke of a dominant patriarchy. It was while she was seeking some means of redressing the imbalance that she was introduced, by chance, to Emmeline Pankhurst, the leader of the WSPU. Though Pankhurst had been vilified for her radical – and often illegal – methods, Smyth was captivated by her and joined the struggle for women’s suffrage at once. After penning the ‘March of the Women’ – which was quickly adopted as the WSPU’s official anthem – she decided to give up music for two years and dedicate herself to the cause. At demonstrations, Smyth was always to be found in the front rank, shouting at the top of her voice and seeing off male intimidation with characteristic ferocity. She was not afraid to use violence, either. On 1 March 1912, in the middle of the WSPU’s most dramatic protests, she hurled a rock through the window of the office of Lewis Harcourt, Secretary of State for the Colonies, an avowed opponent of women’s suffrage and a notorious sexual predator. It was this act of righteous vandalism that earned her a stint in Holloway and paved the way for her concert in the courtyard. When her jail term was up, Smyth returned to music. The years of protest had, however, damaged her hearing. On her doctors’ advice, she visited Egypt, hoping that the climate might help. When that failed, she took any number of medicines. Nothing seemed to work. But she continued writing music – including four more operas and two song cycles. She also took up literature, penning a number of memoirs and at least three novels. In recognition of her contribution to the arts, she was created a dame in 1922; the first female composer to be so honoured. At the time of her death in 1944, Beecham acclaimed her as ‘one of the most remarkable women this country has ever produced or any country has ever produced’. Today, however, Smyth is often overlooked. Her operas are rarely staged; her orchestral works are seldom performed; and her lieder are virtually forgotten. Except for a few produced by Odaline de la Martinez, recordings are almost unknown. Indeed, if she is remembered for anything at all, it is for the ‘March of the Women’ and for her impromptu concert in Holloway. Such neglect is tragic. Not only does it do scant justice to the brilliance of her work, but it also shows how little progress the musical world has made in the direction of gender equality. Surely this year – the 150th anniversary of her birth – would be the perfect time for her to be publicly recognised as a worthy counterpart of Elgar and Vaughan Williams. Surely the time has come not just for #MeToo, but for #EthelToo.